If youâ€™re a frequent traveller on certain Air France–KLM routes in continental Europe, you’ll no doubt have become accustomed to the convenience of getting your boarding pass as an MMS message to your mobile phone. I wrote about this in March, noting that no airline seems to offer such a service within or to/from the UK. Well, when I used the online check-in service at BMI this morning for my flight to Edinburgh tomorrow â€“ Iâ€™m there to do a PR social media workshop for the CIPR â€“ I discovered that BMI has paperless boarding and mobile check-in for certain flights within the UK. I donâ€™t know how long BMI has been offering this service as I can find no date reference to it (not any reference, actually) in their online information centre. But no matter, this is a good start for my first experience flying with BMI. Surely such convenience in providing air travellers with the essential documentation needed to get on their planeâ€“ not to mention the environmental and cost benefits in saving paper â€“ in this digital way is an imperative for airlines to implement asap. SAS Scandinavian Airlines this month launched a two-and-a-half month trial period for the use of mobile 2D barcode boarding passes for travel between seven European cities. Other European airlines began similar trials last year and in the first few months of 2009 have seen broader rollouts. Last month, Air France-KLM extended mobile boarding capabilities to most flights from Paris and Amsterdam to most European destinations except for the United Kingdom. Lufthansa has mobile boarding pass capabilities for most flights originating in Germany and more than 20 other European cities. The carrier offers the service via Web-enabled mobile devices and short message service only for its status customers. 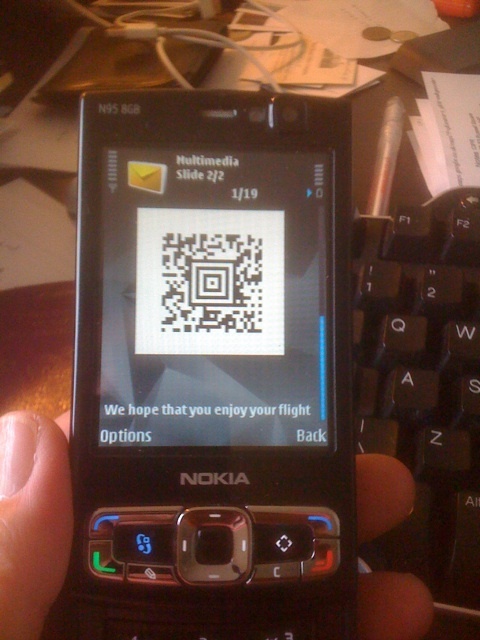 Finnair released its limited mobile boarding pass service earlier this year. BMI now enables barcode mobile boarding passes on U.K.-domestic flights and from London Heathrow to Dublin. British Airways has mobile checkin applications, which it launched globally in October, but it has yet to implement mobile boarding passes. It looks as though mobile barcodes will soon become far more common in more countries and routes as the International Air Transport Association has a 2010 deadline for its member airlines to use such barcodes for printed boarding passes. More detail in this report by Business Travel News. Come on, British Airways, get to it! What a great use of 2d Barcode Technology. I’m used to seeing it in print and mail applications but this is a great idea. I once also worked with a ferry company and there we implemented barcodes on tickets that were printed. People were able to take advantage of discounts, get free meals, entertainment etc via the barcode. It made life easy for the passengers and significantly streamlined operations and customer understanding for the ferry company.